Periodontics is defined as the branch of dentistry concerned with the structures surrounding and supporting the teeth. It focuses exclusively in the inflammatory disease that destroys the gums and other supporting structures around the teeth. 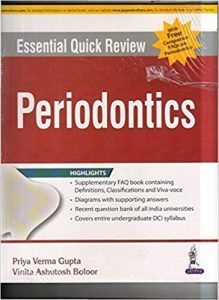 This book “Essential Quick Review Periodontics” gives a complete outline for writing an essay type, a short answer type or a viva voce type of question. The language used is very simple enabling a better understanding with well-illustrated diagrams wherever possible. This book is divided into two sections. This first section comprises of total 61 chapters which are written in question and answer format. Crisp and to the point answers of the questions have been provided in this book. The second section contains recently asked questions covering the majority of the universities in India.